Granados' Intermezzo from the opera Goyescas has been arranged for cello and guitar by Valter Dešpalj, professor of cello at music academies in Zagreb and Liechtenstein. A graduate from the Juilliard School, Mr. Dešpalj studied cello under Leonard Rose and chamber music with Felix Galimir and the Juilliard Quartet. Mr. Dešpalj has performed all over the world, held guest professorships at conservatories throughout Europe, and been an editor of cello music with major music publishers. This Intermezzo Enrique Granados especially composed for the American premiere of his opera Goyescas, given at the Metropolitan Opera House in New York (1916). The composer also made a version for piano. My transcription for cello and guitar is based on both versions. The combination of the two instruments really seems to be perfect for this music. Its Spanish character is enhanced by the variety of tone colors and sound effects they can produce. Also, cello and guitar complement one another very well: the dramatic statements and beautiful melodic lines go to the cello, while the guitar provides rhythmic pulse, counterpoint, and fascinating harmonic modulations. 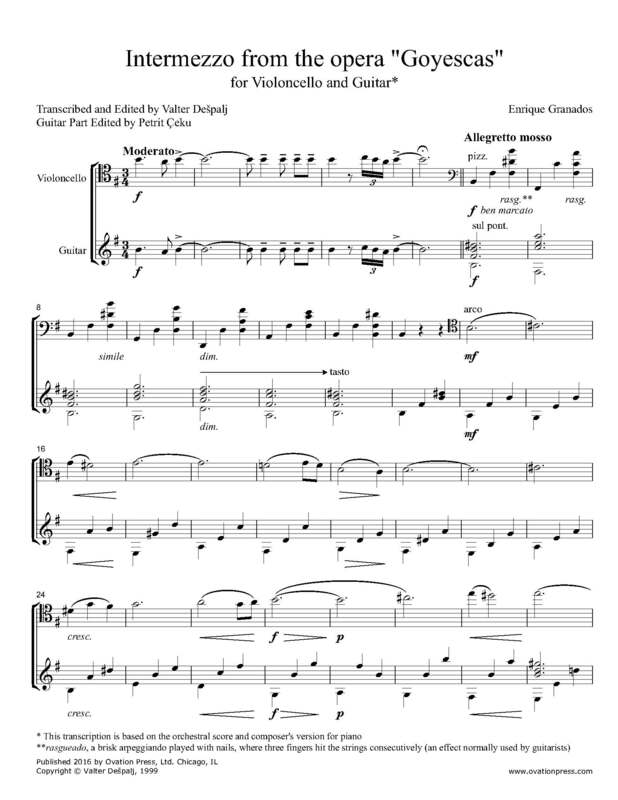 Download and print the score today to gain access to this expertly edited arrangement of Granados' Intermezzo from the opera Goyescas for cello and guitar by Valter Dešpalj!